Through a meta-analysis of 114 results from a total of 39 observational and experimental studies across 14 vertebrate species, including birds, snakes, sheep and humans, the study examines the impact of prenatal exposure to maternal stress on offspring. The researchers analyzed the role of the hypothalamic pituitary adrenal (HPA)-axis, the stress physiological system that is shared across all vertebrates, which ultimately, results in the production of stress hormones known as "glucocorticoids." The HPA-axis is the hormonal system responsible for mobilizing an animal's stress response. Offspring exposed prenatally to maternal stress were found to have more stress hormone levels (glucocorticoids) after birth. This could reflect a biological adaptation with an evolutionary history, as more stress hormones could increase an animal's chances for survival in a stressful environment. "Animals, including humans, modify their stress hormones in response to their environment. Your stress response is set like a thermostat— your body can amp up or down stress hormones in response to anticipated environmental conditions," explains lead author Zaneta Thayer, an assistant professor of anthropology at Dartmouth. An animal's stress response tends to be activated by external factors, such as when its see a predator or whether food is availabile. Higher stress hormone levels among offspring may help extend survival but come at a cost and may affect other physiological systems, such as reproduction. In humans, the mere anticipation of stress or just thinking about prior experiences of discrimination or trauma can activate a stress response. Overactive stress hormones can lead to chronic health problems in humans, including anxiety, depression and cardiovascular disease. "Our stress response is meant to be adaptive to acute stress, such as being chased by predators. However, humans' stress response is often triggered by social evaluative threats and is not serving the adaptive purpose that it was designed for," added Thayer. "This research confirms what other scientists have long speculated that there are trends across species when it comes to linking prenatal stress and offspring hormonal stress responses." 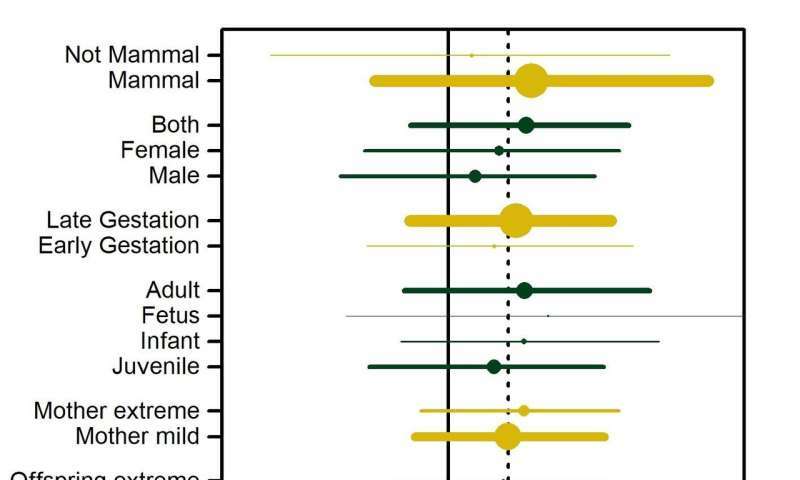 Prior work co-authored by Thayer has explored early origins of humans' health disparities and the impacts of maternal stress during pregnancy on offspring's postnatal stress hormone levels. What it essentially says, is that it takes a solid generation of quiet, in order to effect a stable change in humanity.